Are you ready for some more pomegranate goodness? 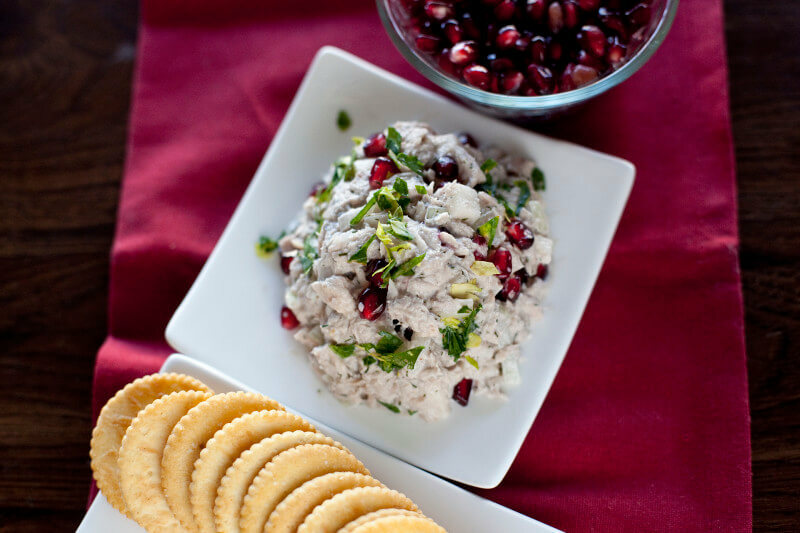 You have got to try this easy pomegranate tuna salad recipe for a quick no cook dinner. I’ve been planning my meals out 2 weeks at a time in order to REALLY stick to our budget. Remember that one of my top ten ways to save money on food and still eat healthy is to plan your meals out. By cooking several meals using similar ingredients you cut back on waste and on how much you have to buy. Last week we ate a meal that had some form of pomegranates in it virtually every day. My favorite meal of the week was this pomegranate tuna salad. This tuna salad uses a couple unique ingredients that a lot of people aren’t used to eating. One is pomegranate molasses, the other is jicama. Pomegranate molasses is a unique tangy and sweet syrup that adds such an interesting flavor. You can buy pomegranate molasses online or in an international market, or you can try making your own. I also buy my fresh dill and parsley at international markets where I typically find them for under $1 a bunch. Jicama looks rather boring, it has a brown skin like a papery tree bark and once cut open reveals plain white flesh. Even the flavor is rather mild, like a hesitant apple in disguise. But the crunch, oh the crunch! The texture of jicama is its shining glory. Each bite is crisp and sharp, like an unripe apple without the sour flavor. It’s a great addition to salads, fresh spring rolls, and even sandwiches. It’s also great on its own as a healthy snack. Jicama is low in calories and high in fiber. It’s also a great source of Potassium and Vitamin C. You can slice it into sticks and snack on as is, or toss the sticks in a little lime juice to give them a kick. If you’re craving chips, trying thinly slicing the jicama on a mandoline for jicama chips. I can eat a whole one in minutes! 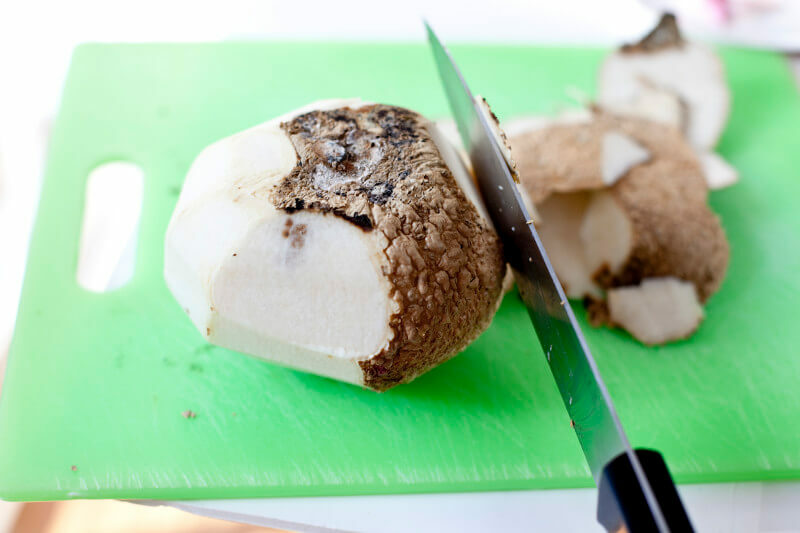 Peeling a jicama is easier to do with a knife than a vegetable peeler. Just cut right below the surface of the skin to peel it off in large chunks. Once it’s peeled you can choose how to cut it. For the tuna salad you’ll want to cut it into 1/4 inch cubes. I really love the contrast of textures in this salad. The jicama is a great substitute for the traditional celery (I didn’t have any celery in the fridge but had a jicama in my fruit basket and thought that would be a better pairing with the pomegranate seeds anyway). 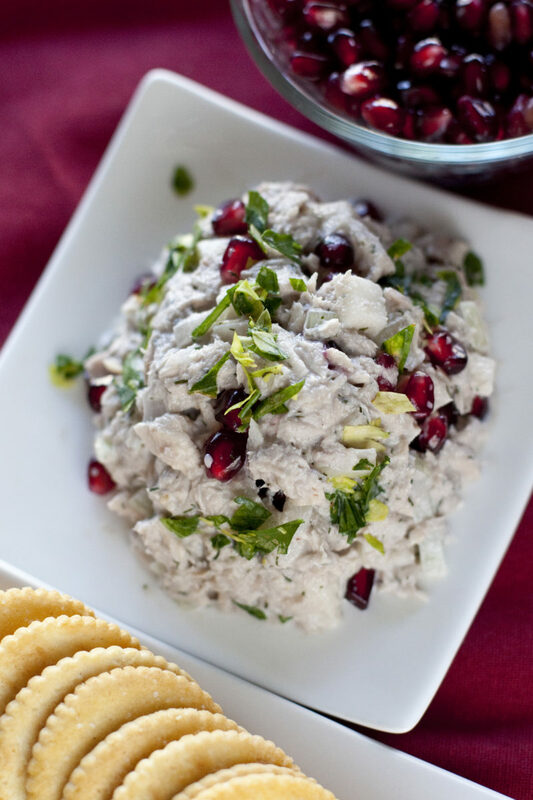 The juicy pomegranate seeds add a sunshiny burst of flavor that makes this a memorable tuna salad. You can definitely eat this in a tuna sandwich, but I like it best as a dip with crackers. It makes a fast and easy lunch or dinner that you can eat on the go. Oh so in case you were wondering, here’s why we have to religiously stick to a budget of $100 for food a week . So that leaking pipe was the emergency release valve on our water heater. It was running for a month which means our water heater was filling itself continually, 24/7 for an entire month. Of course we didn’t figure this out until we got our power bill and saw that our gas usage went up 500% (and $200) from last month. Our power bill is much higher than expected, our water bill will probably be much higher than expected, and we need to replace the hot water heater. Our emergency fund is now going to be decimated. Fortunately we have an emergency fund, and aren’t having to go into debt to fix this, but it hurts…bad. I tell you guys this not because I want you to feel sorry for us, but because we all have hard times happen and I believe that sharing mine helps people know they’re not alone. I also want to make sure to always share my struggles because I’m right there with each and every one of you. I know the fears and the worries. I understand wishing you could eat out but knowing you can’t. I’ve felt the desperation of trying to turn frost bitten ground beef, wilted spinach and macaroni into an appetizing dinner. Ultimately, I have hope. I know God will provide for everything we need, although we may not get everything we want. I recognize that we both have work right now and are hugely blessed. Even though I’m sometimes overwhelmed by my circumstances, I’m not in despair. When we gather for Thanksgiving next week, we’ll have a lot to give thanks for. Do you have any stories of circumstances that seemed terrible but you’re thankful weren’t worse? This easy pomegranate tuna salad recipe is full of flavor and texture, and perfect for a no cook lunch or dinner. If you don't have homemade pomegranate molasses, don't spend a bunch of money buying some, just sub a mix of 1/2 teaspoon of honey and 1/2 teaspoon of vinegar (apple cider or balsamic are my favorite). Drain the tuna and mix it with all the ingredients but the pomegranate seeds. Once mixed carefully stir the pomegranate seeds in. Serve as a dip for crackers or celery or in sandwiches. Approximate cost/serving: This is pretty affordable, especially if you get your tuna cheap (I get mine 6 cans at a time from Sam's Club). It cost me just $1.20 to make a full batch that fed Eric and I for lunch with some crackers. That means 60 cents a serving. The price per serving is even cheaper as an appetizer. Gluten Free: Yes no substitutions necessary. Oh man. Sorry to hear this! Guess life always pulls something out to keep you on your toes. Spent 3 days in the hospital last month that resulted in a CRAZY bill. Needless to say, a food budget is smart. 🙂 Love the pom seeds in here. Great color, bite and tartness. What a great take on Tuna Salad, it looks delicious!! Glad you got your water heater taken care of! 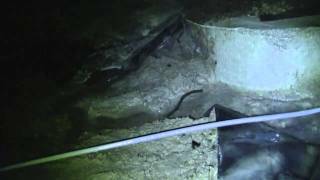 Check with your water company and see if you can get a credit for repairing a water leak. My water company will give you a refund if you prove to them that you fixed a water leak. Thank goodness you and your family have an emergency fund to turn to. Planning makes all the difference in meals and in finances. It’s always the things we pay for over and over again that’s the best place to look for ways to cut back a bit. One of the best ways to save money on groceries is to use leftovers in creative ways. It may not always look fabulous on the plate – but it almost always tastes good, it’s fast and it’s nourishing. Every meal doesn’t have to look like a symphony. The saddest thing for me is throwing away something that went bad in the frig because I forgot it was there in the first place. You will come through this. Oh no! Hopefully you will pull through this my dear. It’s an unfortunate situation but it’s interesting that being more vigilent about your purse strings seems to also have corresponded with some creativity. That tuna salad looks fantastically unique and flavorful and not at all like it should be an affordable dish! Oh man Duo Dishes! Hospital bills are the worst! They’re always unexpected and necessary. Hope you’re doing well now. Lisa that must have been frustrating to realize you needed to pay so much more but it does pay off in the long run to not need costly repairs. Conny unfortunately we couldn’t get a credit from the water or gas company. But it was worth asking. Hey at least when we pay those bills from now on they’ll feel miniscule! Denise I totally agree about repurposing leftovers. It’s one of my favorite kitchen “games”. My husband usually doesn’t like leftovers but often doesn’t even know he’s eating them because I use them creatively. Thanks Kelly, I have been feeling creative in the kitchen lately! This morning I opened the frig to grab the milk carton to put a little 2% in my tea. I noticed I had a fair amount of homemade cranberry sauce from last weekend. Turned it into a layered bar cookie. Came out really good and posted it on my blog. Another example of repurposing leftovers.